The Breakdown: What Is the True Cost of Gas? Imagine that the cost you pay at the pump reflected not only the cost of gas without all of the government tax breaks and subsidies to the oil industry but also the political, health and environmental costs of drilling for oil. Each summer, drivers across the nation seem to suffer a collective anxiety attack about the rising cost of gas. Now imagine that the cost you pay at the pump reflected not only the cost of gas without all of the government tax breaks and subsidies to the oil industry but also the environmental costs of drilling for oil, and the political costs, and the health costs of all that oil. With these factors in place, what would be the real price of gas? 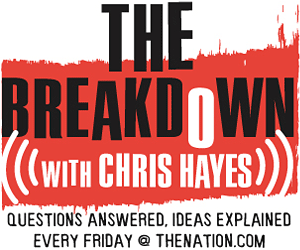 The Nation's Washington, DC, editor Christopher Hayes and energy expert and author Terry Tamminen try to answer this question on this week's edition of The Breakdown. Each summer, drivers across the nation seem to suffer a collective anxiety attack about the rising cost of gas. Now imagine that the cost you pay at the pump reflected not only the cost of gas without all of the government tax breaks and subsidies to the oil industry, but also the environmental costs of drilling for oil, and the political costs, and the health costs of all that oil. With these factors in place, what would be the real price of gas? In an encore edition of The Breakdown, The Nation‘s Washington, DC Editor Christopher Hayes and energy expert and author Terry Tamminen try to answer this question. More information on our guest Terry Tamminen. A column by Ezra Klein on this subject. Note: This episode of The Breakdown originally aired July 15. New episodes will return September 10.